The graphic design below labels the Liturgical Colors with the names of the Liturgical Seasons. Ask your child what color the priest is wearing this week for Mass. We are in “Ordinary Time,” so the Chasuble the priest wears is green. We will rapidly be approaching Advent, an wonderful season to explore the colors that appear in the church. 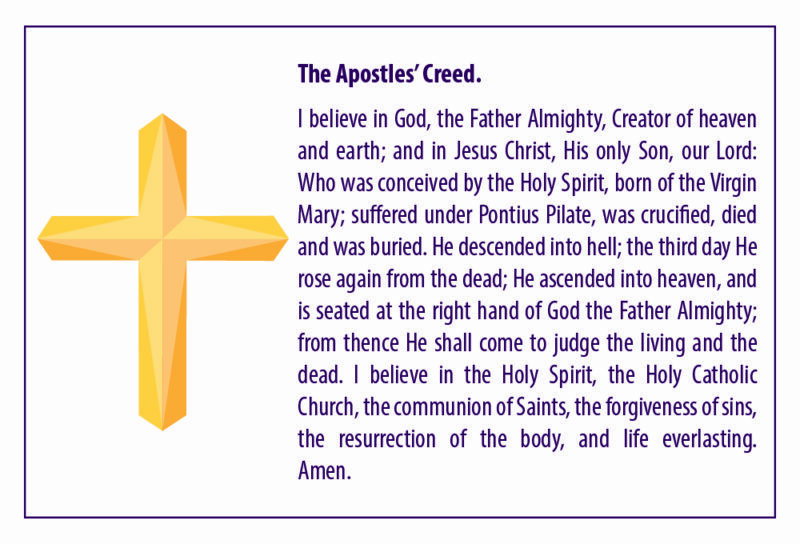 This week, please read the “Apostles’ Creed” out loud with your children. Read it slowly, line for line, explaining the meaning and significance of the lines to your children. 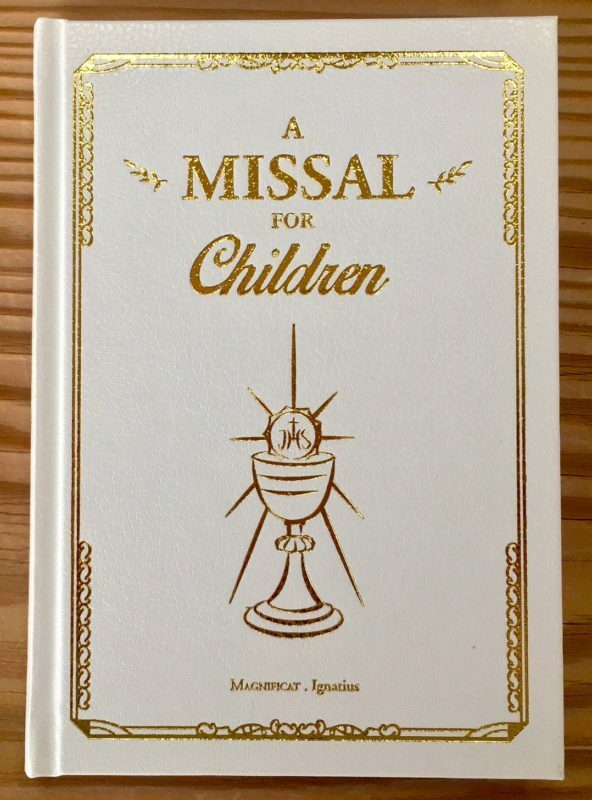 It explains what we believe in as Catholics. If possible, read this each day this week to help your children memorize the prayer. A saint is a person, a human being, just like all of us. A saint may be a man or a woman; a young person or an old person; a person from any country or continent on earth. They have lived, made mistakes, at times made bad choices and sinned. At some point in their lives, however, a person who has received the sanctifying grace of God through faith in Christ, and most especially in the sacrament of baptism, repented for their wrong doings, changed their path, and has gone on in life to do amazing things to help other people and to serve God, can become a saint. A saint is different from an angel, because an angel is a spirit, and a saint is an exceptional human whom God has sanctified through grace, and whom the Church has recognized as having lived a life of heroic virtue. Saints live with God in the Communion of Saints in heaven. The Blessed Virgin Mary is the greatest saint who ever lived, because by a unique grace, God preserved her from the stain of Original Sin from the moment of her conception in the womb of her mother, St. Anne. The Blessed Virgin was not only conceived free from the stain of Original Sin, but she also never committed any personal sin during her earthly life. God’s Love and Christian Life. * Beloved, let us love one another, because love is of God; everyone who loves is begotten by God and knows God. * This is how we know that we remain in him and he in us, that he has given us of his Spirit. 363 In Sacred Scripture the term “soul” often refers to human life or the entire human person.230 But “soul” also refers to the innermost aspect of man, that which is of greatest value in him, 231 that by which he is most especially in God’s image: “soul” signifies the spiritual principle in man. Parents, please read this to younger children, explaining as you go. It’s an excellent explanation of love and promises. “Let’s be friends for ever!” Have you ever said these words to a special friend? Something inside all of us wants love to last for ever. When a man and a woman love each other and get married, they give their word that they will be faithful to each other until death. They make a serious promise! Even though most things in this life are temporary, they want their love to last forever. God made us in his image and likeness, and this image and likeness of God refer to our spiritual nature—our soul. But human beings are not just spirits, like God and the angels; rather, we are a union of body and spiritual soul. Because bodies are made of matter (physical stuff), they can die; but the human soul, which is not made of matter (it is spiritual like God and the angels), never dies. God is pure Spirit, but we have both a body and a spiritual soul (we straddle the line between the animal and the spiritual worlds). Sometimes people think of our heart as our soul, but the soul is actually united with the whole body. Our soul is where we have the spiritual abilities of knowledge and love, like God and the angels, but unlike the rest of the animal world which can neither know the good, nor love and choose it. When we die, our body passes away, but our soul does not. After we die, the souls of those who die in God’s friendship and grace enter heaven (or purgatory, waiting to enter heaven as their souls are purified from the effects of sin). In heaven, all blessed souls who are separated from their bodies wait for the Resurrection of the body in the second coming of Christ, in which our souls will be rejoined with our risen bodies, and we will be “in communion with God” in both body and soul. 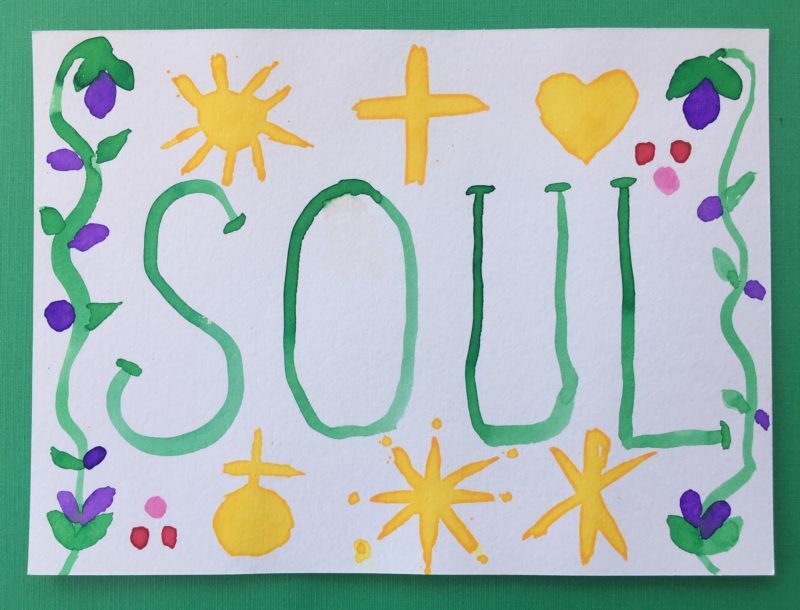 This week, we are making a “mini poster” for your child’s room so that they can reflect upon the meaning of their “soul.” Invite them to decorate a small piece of white watercolor or drawing paper and write the word “SOUL” across the page. Encourage them to decorate the paper as they wish. 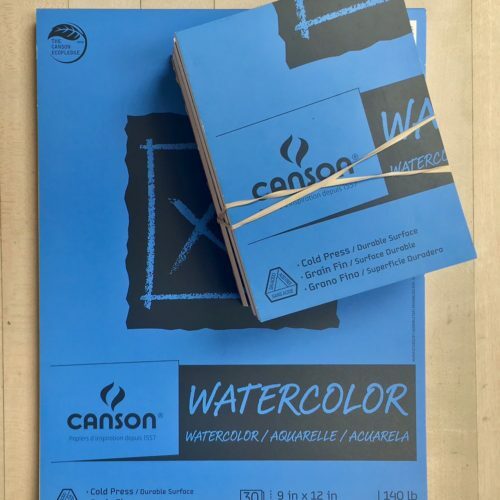 I used liquid watercolors and a small paint brush on a quarter page of watercolor paper. 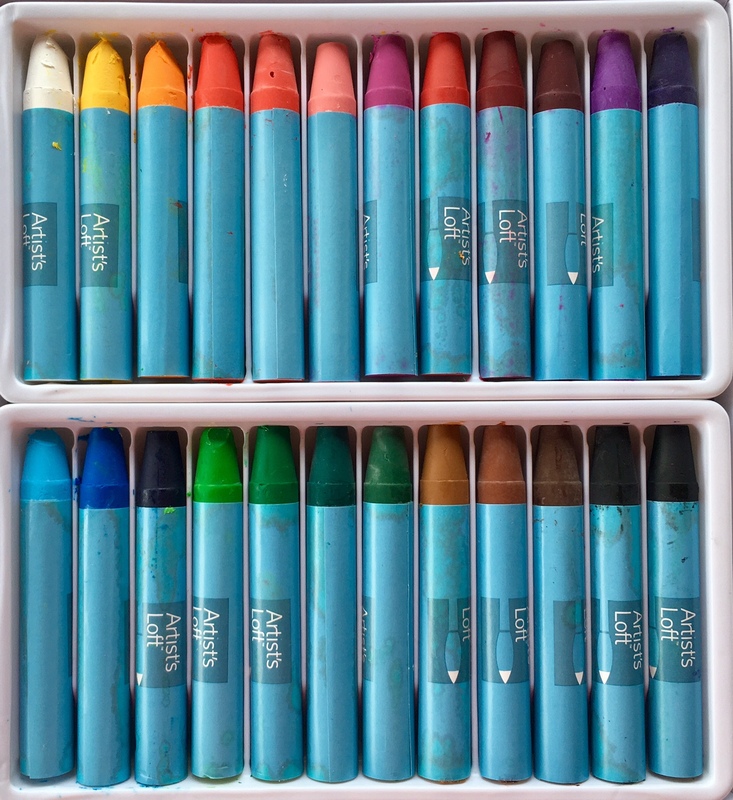 I used the “Liturgical Colors” to reinforce the child remembering what they are–green, lavender, white, gold, red and rose. 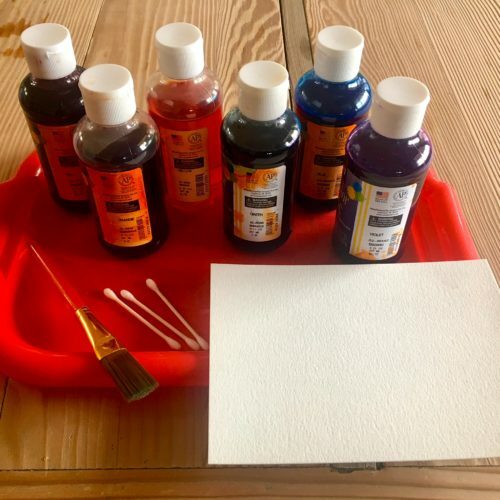 The art project this week is a watercolor featuring “Liturgical Colors.” The liturgical colors are: green, lavender, white, gold, red and rose. 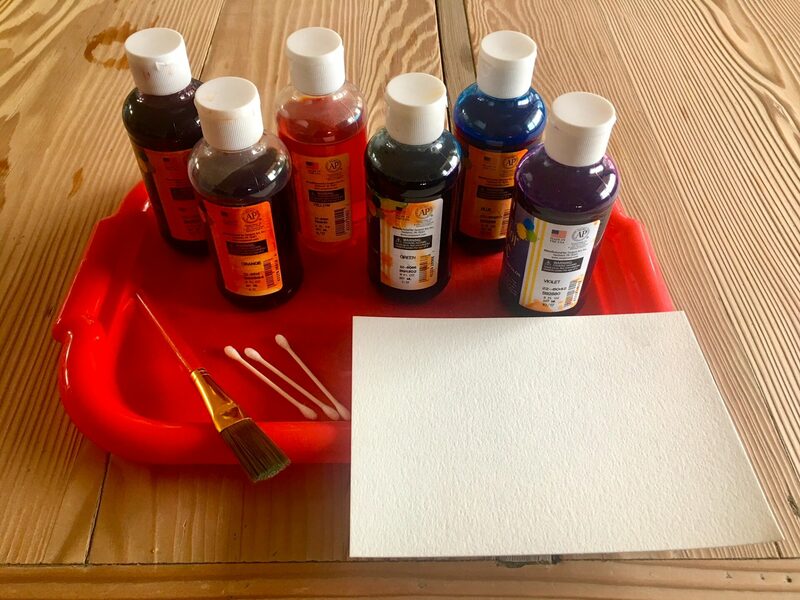 I drew circles with a white water soluble pastel on watercolor paper before painting, then I painted one color at a time in “patches.” When the painting dried, I traced circles with a pencil using any household item that had a circle base, then I cut them out. 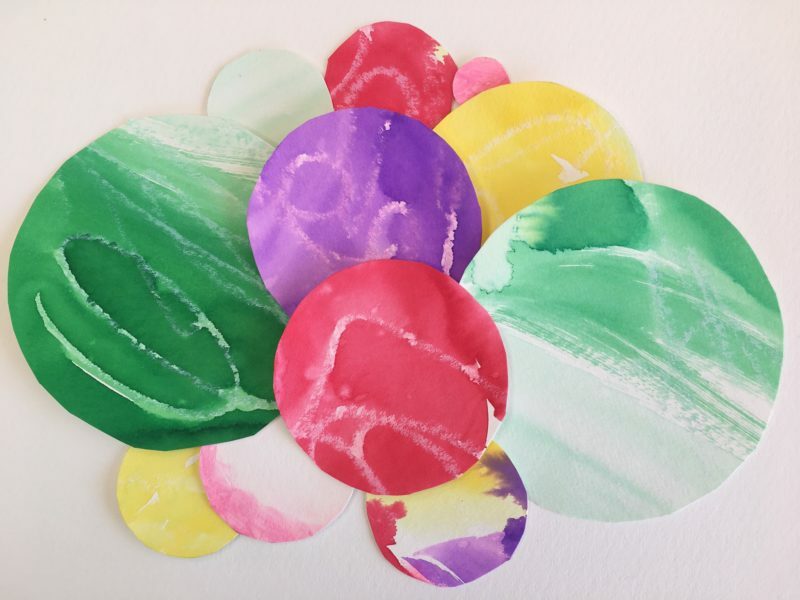 I played with different arrangements of the cut-out circles before glueing them onto a sheet of watercolor paper. 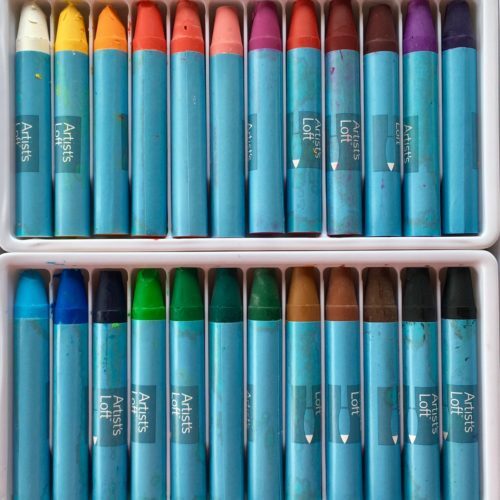 I like how the pastel resists the watercolor leaving interesting white marks. Young children will need a older partner for this project. It is simple but takes a bit more time than a plain painting or drawing. 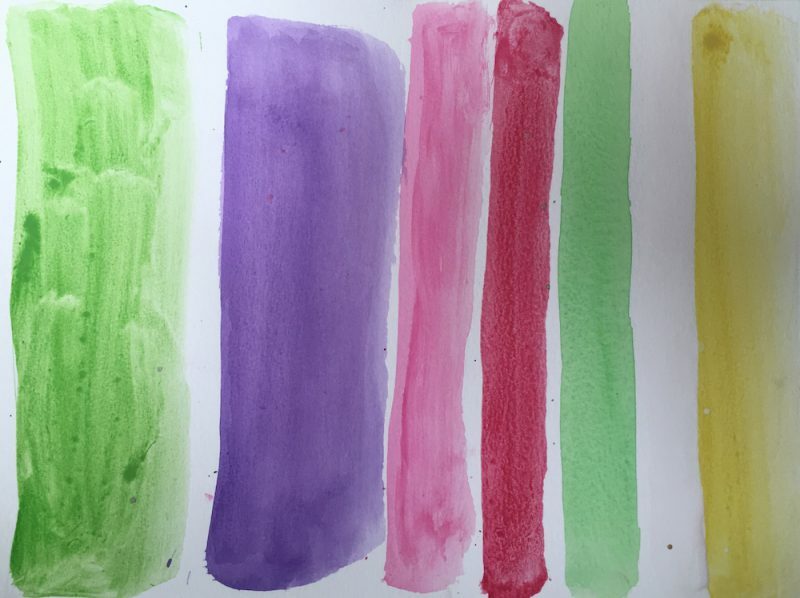 Or, they can make simple stripes of liturgical colors on the paper, like the painting below, and that is great, too! 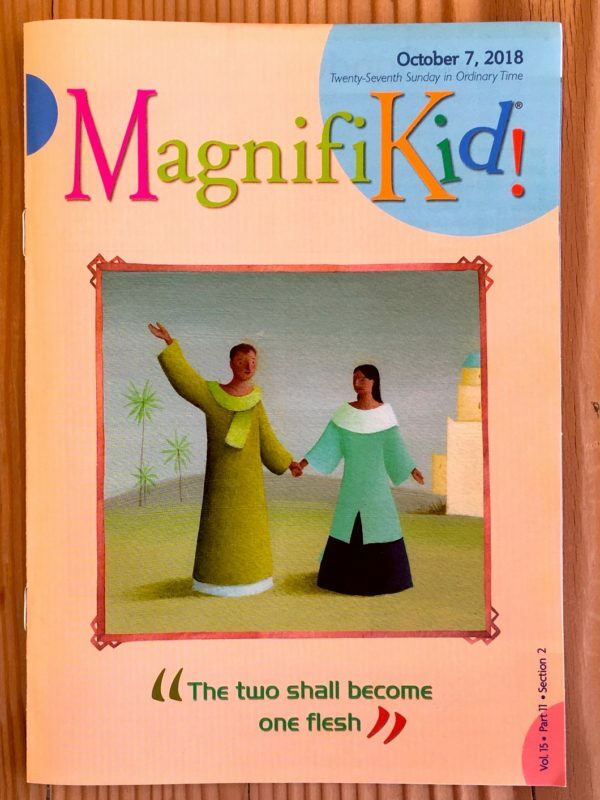 Please read with your child: “The Tower of Babel” Genesis, chapter 11:1-9 from your family Bible or a Catholic Children’s Bible. Click on the link to the story from the USCCB.org. 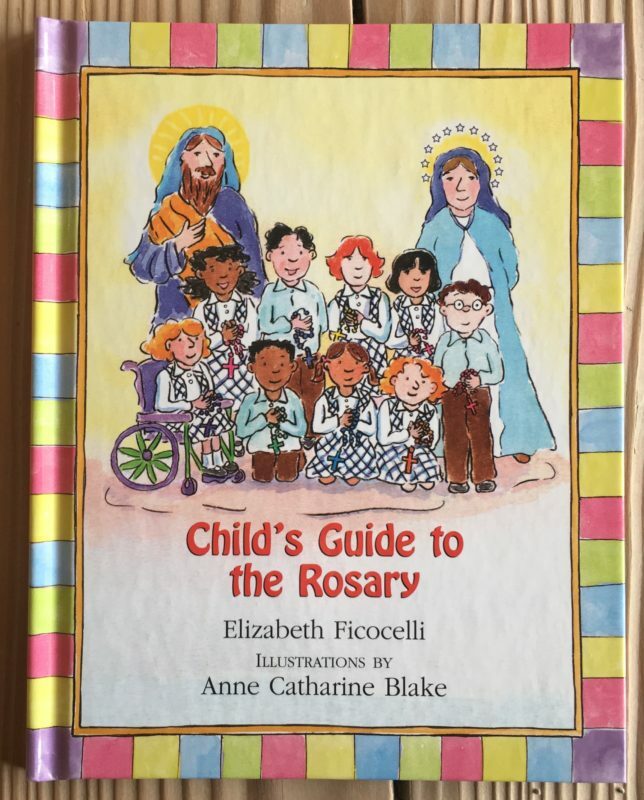 Note to Parents* Next week we will begin to learn about Jesus by learning the Mysteries of the Rosary .